Meet Nora Meraz and her daughters Ana, 16, Natalie, 11 and Ruby 4. Growing up in Basalt, with extended family still residing in the mid-valley, Nora has never considered leaving the area. After the struggle of completing High School at Yampa as a teen Mom, Nora began her career in the medical field at the front desk of Mountain Family Health Centers. Next she attended CMC to achieve her CNA and has a dream of one day becoming a Registered Nurse. Nora works as a Medical Assistant at Grand River Health. This essential position in our community provides Nora and her family with enough income to get by, but, without Habitat’s assistance, not enough income to ever achieve the goal of homeownership. Ana is proud to be a part of Rifle High School’s elite IB program and her goal of becoming an Emergency Room Pediatrician already set. Natalie, who is bursting with character, will quickly talk her way into your heart, with her dreams of becoming a lawyer. Ruby is full of smiles and love from her family! 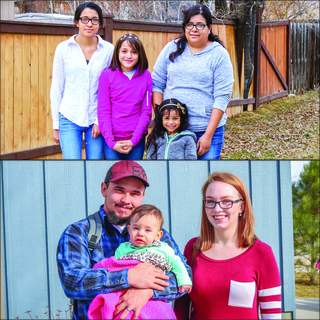 Habitat analyzes “Need” (as well as readiness) when selecting families and the Meraz family is currently overcrowded in their two bedroom rental unit in Rifle. A new home will provide space for these three young women to spread their wings, soaring to achieve their high aspirations. Michael moved to Silt into his family’s Habitat for Humanity Home for his senior year of high school. He admits to not fully comprehending the opportunity his family was being presented, and was quite resentful of having to move. As a teenage boy all he wanted was to graduate from Grand Valley High School with his friends. He specifically remembers the moment he began to understand what home ownership meant to his parents. The day they moved into their home, he watched his stoic hard working parents, sitting on the floor of an empty home sobbing in each other’s arms. Fast forward a few years, Michael has become a father and his main goal is to provide a stable home for Chloe. While Raynee only imagines how home ownership dramatically helps families. She moved almost every year growing up, struggling to start a new school every fall and gave up unpacking boxes. All she wants for her daughter, like most parents, is the stability of growing up in a consistent home. Habitat statistics show that children living in a home their parents own are 118% more likely to attend college.